Curriculum – Welcome to St. Mark's Preschool! 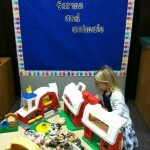 St. Mark’s Christian Preschool uses a curriculum called FUNdamentals by Joy Anderson. FUNdamentals is a developmentally appropriate, activity-based curriculum for children AGES 2-5 that focuses on BASIC SKILLS CHILDREN NOT ONLY NEED TO LEARN BUT ARE ALSO EXCITED TO LEARN! 1- Life Science Skills: Each weekly life science theme, such as Vehicles, Astronomy, Baking, or Ocean, offers fun activities to expand children’s knowledge of the world so they can feel confident with their place in it. 2- Life Skills: Each day the children engage in a lesson with puppets or games, helping them practice vital life skills like hygiene, health, sharing, time, and safety. 3- Pre- K Skills: Each activity aims to teach children the critical Pre-K skills needed to succeed in school later on, such as learning to write, understanding simple math, and also knowing their letters, sounds, numbers, shapes, and colors among other things. 4- Bible Lessons: We sit together and read an exciting story from the Bible and then chat about the lesson that story teaches. Each month is a new objective with a new story, character, and lesson discovered every week. Scripture and songs that complement the lesson are also learned. Getting to know God is FUN! 1- Geography: Each Tuesday and Thursday students will explore maps, land masses and bodies of water, global regions, countries, and cultures. 2- STEAM: Afternoon Wrap around students will discover Science, Technology, Engineering, Arts and Mathematics with cool experiments and games. We have 36 themes, 26 A-Z themes and 10 holiday themes. We also use Handwriting With Out Tears to teach writing just like the Rush-Henrietta School District so there is no confusion with teaching different handwriting techniques. Because of this, we do not follow the alphabet in order- for instance, in year 1, the first theme we are studying is the theme for “M”- Me. Next we will be moving to “N”- Nursery Rhymes. Helps children respect others, take turns, listen, and tell stories. Pledge of Allegiance, Calendar, and Weather Chart help children learn repetition and prediction. Helps children write letters, learn letter sounds, recognize the letters on signs, and understand that letters are used to communicate. Helps children sort manipulatives, count groupings, feel through sensory activities, and develop fine motor skills. Helps children learn movement, rhythm, instruments, beats, and finger plays. Arts and crafts help children cut, glue, write their name, learn shapes and colors, follow directions, work with art materials, and clean up. Helps children learn how to use good manners, talk nicely to friends, help the teacher, and clean up. We also do a devotion during this time. The children learn about God in a way that relates to them with a story, a bible verse, and a prayer. Helps children ‘read’ to each other, develop a love for favorite books, take care of books, and spend time independently. Life sills are also taught here and will help children learn how to eat healthy, safely cross the street, share toys, not talk to strangers, and lots more! Helps children share toys, respect other people’s property, treat others kindly, exercise, pretend, obey rules, and develop gross motor skills.